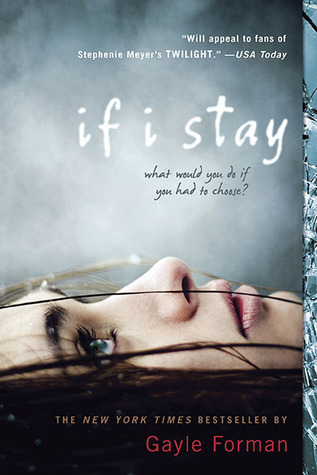 If I Stay is a heart-achingly beautiful book about the power of love, the true meaning of family, and the choices we all make. And there was so much noise. A symphony of grinding, a chorus of popping, an aria of exploding, and finally, the sad clapping of hard metal cutting into soft tress. Then it went quiet, except for this: Beethoven's Cello Sonata no. 3, still playing. The car radio somehow still attached to a battery and so Beethoven is broadcasting into the once-again tranquil February morning. I want to break the double doors. I want to smash the nurses' station. I want it all to go away. I want to go away. I don't want to be in this hospital. I don't want to be in this suspended state where I can see what's happening, where I'm aware of what I'm feeling without being able to actually feel it. I cannot scream until my throat hurts or break a window with my fist until my hand bleeds, or pull my hair out in clumps until the pain i my scalp overcomes the one in my heart. I'm staring at myself, at the "live" Mia now, lying in her hospital bed. I feel a bust of fry. If I could slap my own lifeless face, I would. I have a feeling that once you live through something like this, you become a little bit invincible. I know that makes me a bit of a hypocrite. If that's the case, shouldn't I stay? Soldier though it? Maybe it I'd had some practice, maybe if I'd had more devastation in my life, I would be more prepared to go on. It's not that my life has been perfect. I've had disappointments and I've been lonely and frustrated and angry and al the crappy stuff everyone feels. But in terms of heartbreak, I've been spared. I've never toughened up enough to handle what I'd have to handle if I were to stay. If I Stay is a rather quick read - I read it in a matter of hours - because it's both short and engrossing. Unless you've been living under a rock, you know the premise of the novel. Mia and her family are involved in a fatal car accident that leaves her in some form of purgatory. Her body is unconscious, but her consciousness (?) is aware and drifting around the hospital watching her friends and family through an exceptionally emotional and dramatic time. Mia's life story is told through a variety of flashbacks, typically inspired by those who are coming to visit her in the hospital or things they have said. I thoroughly enjoyed this type of storytelling as it allows us to feel what Mia was feeling and learn about her and her family. We were able to connect with her in a way we wouldn't have been able to in a linear format. The memories themselves aren't linear, jumping from just a few months ago to being in the delivery room when her mother gives birth to Teddy and back. Mia seems to have had a wonderful life, surrounded by love, and has she has these memories and sees her family surrounding her she is faced with the decision as to whether or not to stay. She is fully aware that if she does, nothing will be the same. But at the same time, is she ready to leave everybody behind? We don't get too much characterization of the other characters, but the peaks into Mia's life let us know that leaving them behind will not be an easy choice for her to make. It's not a big secret that Mia lives (the sequel Where She Went that takes place between Mia and Adam three years later), but that doesn't take away from the emotional impact of If I Stay. I don't think you could read it and not be affected in some way.